Transcend decking’s deep wood-grain pattern and eight luxury colors create a premium, ageless look that leave other composites in the dust. Transcend maintains its vibrant color and luxurious finish–come scorching sun or red-wine spill–thanks to its unyielding, three-side shell protection…and our 25-Year Limited Residential Fade & Stain Warranty. Unparallelled beauty – with superb high-definition wood grain patterns and elegant tropical hardwood finishes, Transcend® Composite Trex® Decking is unmatched in its brilliance and ingenuity. Trex® decking is engineered with a low-sheen, high-traffic technology, ensuring its timeless durability. Transcend® Composite Trex® Decking comes in five stunning tropical hardwood colours, allowing you to mix and match your composite Trex® decking with your screening, wall cladding, balustrading, lighting, and outdoor furniture selections to create your own decking utopia right here in Perth. An environmentally friendly replacement to timber and specifically merbau decking. Guaranteed to withstand the rigors of time Trex® decks come with a 25-year Limited fade and Stain Warranty. Elegant warm brown tone, exquisite suitable for any house colour; Tiki torch has become an instant favourite among home owners in Perth and WA. Deep Cherry-Black with beautiful hardwood streaking; similar to local Perth Jarrah Timber, or imported Merbau Timber decking. Premium rich brown earthy feel, and a warm multi-coloured mid-range; spiced rum deck will add an elegant touch to even the most traditional Perth home. Immaculate grey tone with elegantly streaked nuance; Island Mist offers a refined weathered timber decking look perfect for your contemporary Perth home design. The warm glimmer of Havana Gold offers a unique way to upgrade our WA backyards with a rich, exotic aesthetic without the maintenance or environmental devastation. WINCHESTER, VA, Dec 04, 2014 (Marketwired via COMTEX) — When it comes to environmental stewardship, Trex Company leads by example — both at home and abroad. The world’s largest manufacturer of wood-alternative decking and railing recently received top honors at the GAIA Awards, the Middle East’s premier awards program for sustainable, eco-friendly building products and manufacturers. Out of nearly 200 nominees, Trex was among just 12 finalists recognized for exemplary green building credentials. Introduced to the Middle East region in 2011, TrexÂ® has been well-received as a product of choice for numerous high-profile projects, including the lavish outdoor space of the Dubai JW Marriot Marquis, the world’s tallest hotel. Most recently, Trex was chosen to provide its high-performance deck boards for what will be the longest constructed boardwalk in the Emirate and a key element of the new Jumeirah Corniche Development Project in Dubai. The vision of Sheikh Mohammed bin Rashid, Vice President and Ruler of Dubai, the Jumeirah Corniche project aims to convert eight-and-a-half miles of beachfront property into a vibrant recreational area that encourages exercise and sporting activities among both residents and tourists. The project includes a five-meter-wide walkway, a four-meter-wide jogging track, rest areas, retail kiosks and shaded benches overlooking the beach. When completed, the Corniche will be the longest in the territory and represents the largest use of Trex decking in a single public installation. Trex offers consumers a truly environmentally responsible choice. The entire high-performance Trex decking portfolio — including Trex TranscendÂ®, Trex EnhanceÂ® and Trex SelectÂ® — is manufactured from more than 95 percent recycled content, including reclaimed wood and sawdust, as well as plastic from many common household items — such as case overwraps, sandwich/bread bags, newspaper sleeves, dry cleaning bags and grocery/retail bags. In fact, Trex salvages and keeps more than 400 million pounds of plastic and wood scrap out of landfills each year. The company’s manufacturing process also is as green as its final product, with a proprietary method that recycles factory refuse back into the manufacturing line. Additionally, Trex regularly seeks third-party audits to ensure that it is continually improving green practices while meeting all environmental, health and safety guidelines and industry regulations. The company is the first in the wood-alternative decking industry to receive an International Code Council Evaluation ServiceÂ® (ICC-ES)* SAVE Verification for Recycled Content. Based in Winchester, Virginia, Trex invented the composite decking category more than 20 years ago and continues to lead the market in both sales and share. Trex currently is stocked in 42 countries and in more than 6,700 retail locations worldwide. 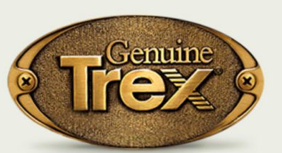 For more information about Trex products, visit trex.com. *ICC-ES is a subsidiary of the International Code Council. For more information about ICC-ES, visit icc-es.org. The GAIA Awards are recognized as one of the industry’s most respected awards honoring those construction equipment and products that have truly integrated the concept of moving toward a more sustainable built environment. A panel of industry experts with acclaimed credentials selects winners who have demonstrated an exceptional and unique product that has successfully been integrated into the built environment in the MENA region. For more information, visit http://www.thebig5.ae. Trex Company is the world’s largest manufacturer of high performance wood-alternative decking and railing, with more than 20 years of product experience. Stocked in more than 6,700 retail locations worldwide, Trex outdoor living products offer a wide range of style options with fewer ongoing maintenance requirements than wood, as well as a truly environmentally responsible choice. For more information, visit trex.com. You also can follow Trex on Twitter (@Trex_Company), Pinterest (trexcompany), or Houzz (trex-company-inc) “like” Trex on Facebook, or view product and demonstration videos on the brand’s YouTube channel (TheTrexCo).